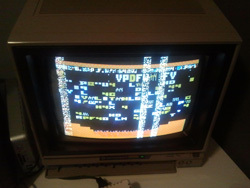 If you’ve tried playing a few games on an actual Atari 800 XL computer, or through APE or AspeQt and you end up with garbage on your screen, or perhaps the game or application is behaving weirdly, try disabling the BASIC ROM from creeping into the Atari’s address space. By default, the Atari will copy BASIC from ROM into RAM, which in turn will consume a certain amount of memory (around 8 KB), which is located at the address $A000 and runs until $BFFF. The Atari doesn’t have memory protection mechanisms; if a program overwrites that location, the OS will not tell you about it. If the program you are trying to load uses most of the Atari’s 64 KB of memory, then will get memory overwrites at certain address locations. This in turn will likely cause corruption of the program and may lead to crashes, asset corruption, and other oddities. To prevent BASIC from being copied into RAM, press and hold the OPTION key during the boot process.